This is a song you may have heard on that Netflix show “The Haunting of Hill House,” which I want very badly to watch, except keeping up with every Netflix original would require extended joblessness. In any case, the global exposure has helped “All You Got Is Gold” find the charts from Chile to Hong Kong to Everywhere, USA. 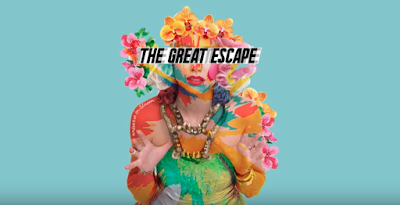 The song is the first single from the Great Escape’s third album, as yet untitled, as yet released. The Great Escape is a three-piece California band with Kristian Nord on drums and bass, Malte Hagemeister playing guitars, and Ingrid Andersson singing. 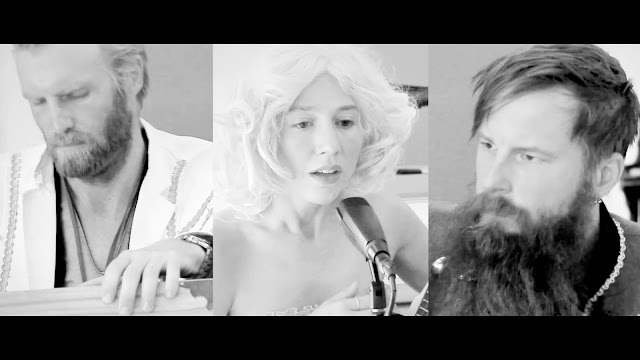 Included at the bottom is a black & white music video of the trio playing a live, stripped-down take of the song. The video itself is stripped-down as well. No color. No band members strolling slow motion through a flower field. Just them and their instruments and the collected moment of this song being played. It’s as precious as it sounds, though perhaps a bit cooler than that. This is thanks mostly to Hagemeister, adding buttloads of flair with his Civil War-era jacket and chest-length beard. He strums high, lilting notes, bobbing his head. Andersson is an adorable face framed by white, tameless curls. She holds a banjo in her lap, with the neck raised high, and plucks at it gently. Nord plays an accordion-thing and tambourine-pedal with his head mostly lowered, swaying to the music, his blonde-streaked, swept-back hair letting you know that this band deserves to be famous. Even their name is grandiose. This version of the song offers a quieter take obviously and lacks some of the power that the full studio version carries. However, the best thing to like about this version (or any acoustic version of any song ever) is the added emphasis on lyrics: “April springs bring hope again, let us feel not understand. Have you missed that love affair? It still lingers in the air…” Fitting words for any horror show, I’m sure. The song is gorgeous. So is the band. So is the video. I look forward to hearing (and seeing) more from them.